US PRESIDENT-ELECT Donald Trump has called a proposed recount of votes in three pivotal battleground states a “scam”. “The people have spoken and the election is over,” Trump said in his first comments about the growing effort to force recounts in Wisconsin, Michigan and Pennsylvania. Trump, who repeatedly challenged the integrity of the US election system before his win, called the recount push “a scam by the Green Party for an election that has already been conceded”. “The results of this election should be respected instead of being challenged and abused, which is exactly what Jill Stein is doing. “We must accept this result and then look to the future,” he added. Green Party nominee Jill Stein’s fight for a recount got a major boost on Friday when Wisconsin officials announced they were moving forward with the first presidential recount in state history. The incoming president had been paying little if any attention to Stein’s recount push, but Democratic rival Hillary Clinton forced his hand yesterday by formally joining the effort. Stein, who drew 1% of the vote nationally, is raising millions of dollars to fund the recounts. “Because we had not uncovered any actionable evidence of hacking or outside attempts to alter the voting technology, we had not planned to exercise this option ourselves,” Clinton campaign attorney Marc Elias wrote in a blog post. But now that a recount has been initiated in Wisconsin, we intend to participate in order to ensure the process proceeds in a manner that is fair to all sides. Clinton leads the national popular vote by close to two million votes, but Trump won 290 electoral votes to Clinton’s 232, with Michigan still too close to call. It takes 270 electoral votes to win the presidency. 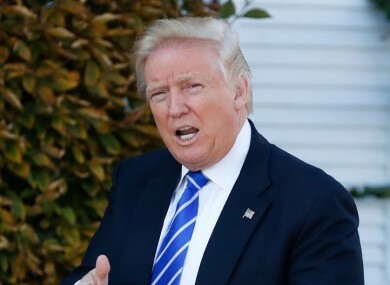 Trump is expected to return to New York today after spending the Thanksgiving holiday weekend at his West Palm beach estate. His transition team said he has scheduled a series of meetings tomorrow with prospective administration hires. Email “Donald Trump calls election recount 'a scam'”. Feedback on “Donald Trump calls election recount 'a scam'”.